There were several incidents of violence and protest related to the military and to students during 2017 and 2018. Security forces in Bouake clashed on 8 to 9 January 2018, resulting in the destruction of military buildings. Military protests also occurred in several cities in Côte d’Ivoire in January, February and May 2017. The government reached an agreement with the soldiers resulting in an end to their protests. You should be vigilant near military barracks, military installations, large crowds and demonstrations. In the event of unrest monitor local media and follow instructions given by local police and security personnel. On 18 September 2017 students protested around the Université Houphouet-Boigny in Abidjan, police responded with tear gas. UK health authorities have classified Côte d’Ivoire as having a risk of Zika virus transmission. For information and advice about the risks associated with Zika virus, visit the National Travel Health Network and Centre website. The British Embassy in Abidjan can provide emergency consular assistance. 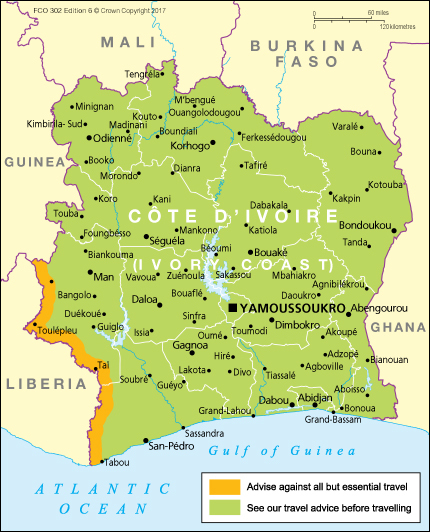 Consular support is not available in parts of Cote d’Ivoire where we advise against all but essential travel.